The art of penmanship is alive and well! Here’s how I used the Spencerian Penmanship system to improved my cursive for handwritten letters and my journal. The journaling community understands the importance of good handwriting. The sheer popularity of the #RockYourHandwriting Instagram challenge shows how many people still value the handwritten word. Fine handwriting makes our personal journals more pleasing to revisit. 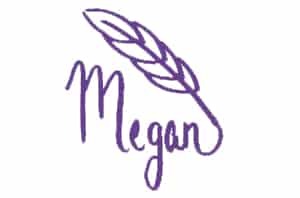 When we send a letter to a friend, it is the penmanship that conveys the message, giving richness and tone to each word on the page. It’s true that our day-to-day lives are ruled largely by computers, but there’s still something distinctly authentic and intentional about putting pen to paper. As I became more aware of my handwriting through journaling, I saw small improvements. Still, I wanted to find a handwriting guide that would give my letters that little something extra. 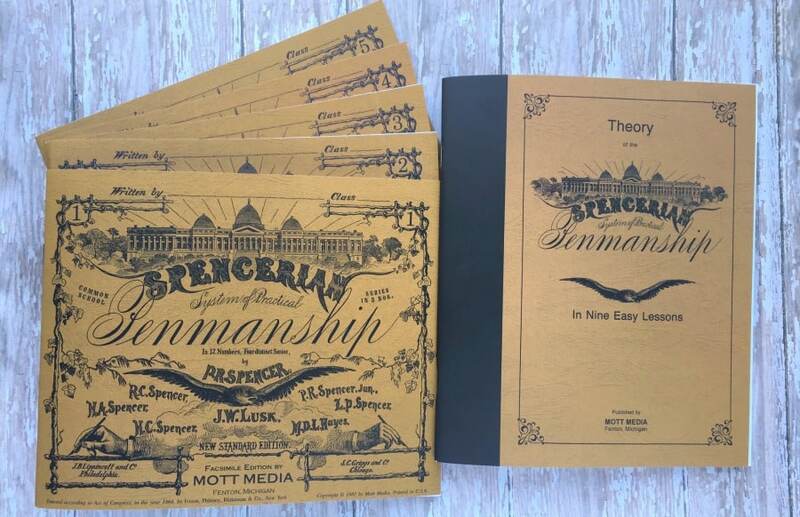 Enter, The Spencerian Penmanship Program! In short, Spencer was a man obsessed with penmanship (lucky for us). 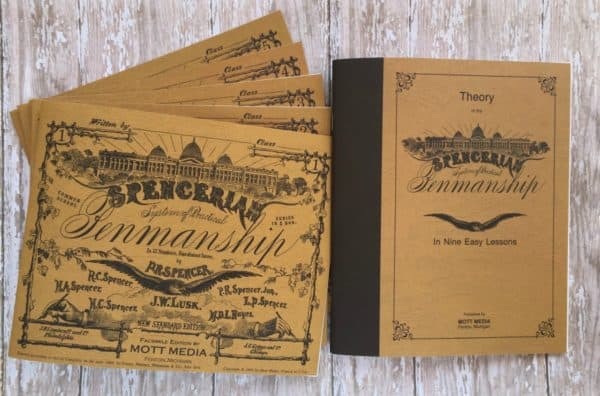 His “Spencerian Script” became the standard for teaching students handwriting in the mid-1800s. It remained popular until the early 1900s, when the more basic Palmer method gained favor (if you grew up in the U.S., you likely learned a version of Palmer’s cursive in third grade). 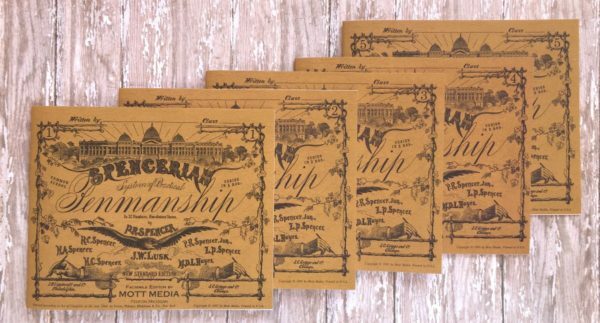 Spencerian script is known for combining beauty and practicality, and I couldn’t resist a peek into the Victorian years with these books! I ordered a complete set of the books on Amazon. It comes with 1 Theory book and 5 Copy books. **NOTE: There are sets on Amazon that don’t include everything! It is vey important that the theory book and all 5 copy books be used together. One is useless without the others. My links take you to the complete set. The Theory Book: Covers everything from the proper way to sit, to the ideal slant for your script (precisely 52 degrees to the right, thank you very much). I can just imagine the ruler-wielding teacher telling everyone to sit up straight! A note for my left-handed friends: This book is straight from the days when left-handedness was considered undesirable. Be prepared to do some creative adjustments, as the instructions are only written for the right hand. I wish the publishers would have corrected the oversight when they republished, but alas, they didn’t. *UPDATE: My very kind reader, Maria, send me a link to some left-handed calligraphy resources. 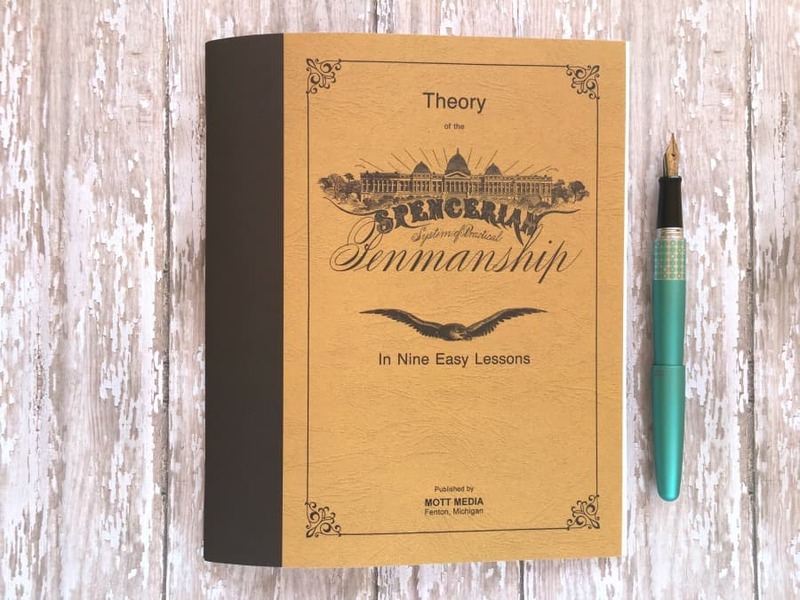 They are a good place to start if the Spencerian books don’t address your concerns. Five Copy Books: The copy books are lined practice books. The first book has short drills on line and curve formation, finding the correct angle, spacing, and so forth. Each copy book fulfills specific lesson sets, so they’re all a little different. The photo above shows how Copy Book #1 is ruled. The Theory book provides details on how to form each letter, and the copy books gives examples and drills to practice each pen movement. Each copy book is ruled differently, since you’ll need less guidance as your script improves. The photo below shows copy book #5, which provides ruled pages and practice phrases for the final exercises. Plain yellow legal pads – They’re cheap and they work. Win, win! 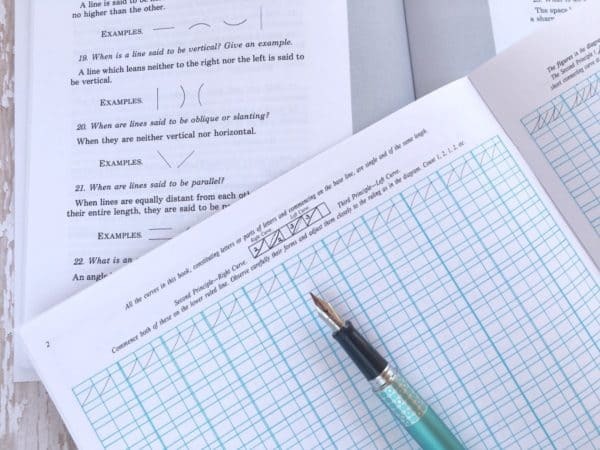 Rhodia graph paper notepads – while you’re learning to form your letters, you might like the extra reference lines of graph paper. Rhodia lined notepad– Rhodia is great for fountain pen users, so you’ll get crisp lines as you practice. Pilot Metropolitan (Medium)– This is the one I used in the photos below because I wanted a nice dark line for you to see. Lamy Safari (Extra-Fine)– For my own practice, I prefer a finer pen. The Lamy Safari is an affordable option for a high-quality pen. 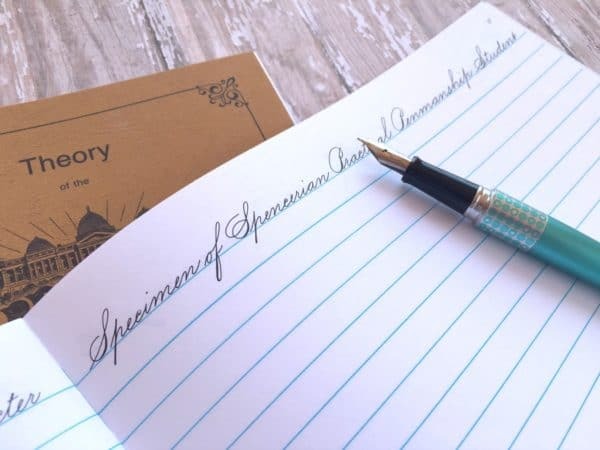 Speedball Calligraphy set– If you want the full experience of Spencerian penmanship, a dip pen is the way to go. I have the Speedball set, which I supplemented with some higher-end nibs. For a beginner like me, it’s a great option. I read through most of the theory book before I began the practice drills. But when I opened my copy books, I couldn’t bring myself to write in them! I was afraid I would run out of pages before I mastered the pen strokes. So…I created a PRINTABLE with a page for each book! The printable has 5 different pages: one to supplement each copy book. 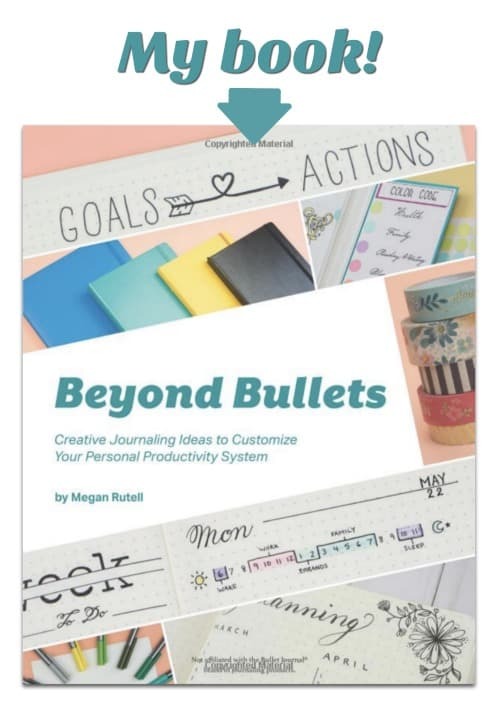 You can print as many as you need to master the skills in each copy book! I’ve enjoyed these books so much, and I can’t wait to get some beautiful letters in the mail! I hope you enjoy them. Have a great week! I want to hear from you! What are your favorite techniques for improving your handwriting? I have this set and I am afraid to write in them too! LOL Thank You SO much for making the printable sheets! I’m a lefty so it is going to be rather challenging. 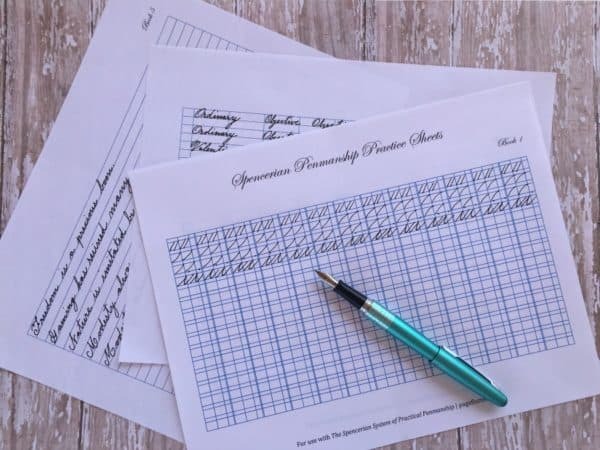 I hadn’t heard of it before, but it looks like what I have been looking for as I would love to improve my handwriting, so it has now been promptly added to my ever increasing wishlist 🙂 Plus thank you for the printables! My pleasure, Paula! I hope you find these books as enjoyable as I have. There’s something so lovely and nostalgic about finely written words. I remember thinking my grandmother’s handwriting was so elegant. She would have been a school girl in the 1890s, so this would have been the way she learned. I learned ‘Palmer’ style and really miss all the ‘flourishes’ that went away in the switch between Spencer and Palmer. Now they don’t teach cursive at all in school. Sad. I’m currently in high school, so I’m still considered a “kid” (lol much to the chagrin of me and my fellow teenagers). However, with all of this talk of kids not learning cursive anymore, I’m really thankful that the elementary school I went to still taught cursive. I’m not sure about the current situation, and it was nothing fancy by any means, but it has set a good, strong foundation for learning calligraphy (and just writing fancily in general). Mae-Mae, you are so fortunate to have attended a school that taught cursive! Some schools still teach it, but fewer and fewer each year. Most of them have replaced cursive with typing (although I never had typing class in elementary and I can still type like a madwoman…most kids pick it up on their own nowadays.) I’m so glad you’ve been able to channel your cursive skills into calligraphy. It’s a beautiful art! If you print these and laminate them you can practice with a fine point dry erase marker and reuse the sheet over & over again. Hello! I’m a complete newbie and a leftie to boot! I can already tell that my “angle” is either 90 degrees straight up or leaning to the left! Can you offer any suggestions or resources for me to learn to adapt? Calligraphy is essentially PhD-level cursive, so their advice will be better than anything I could offer. I hope that helps! Keep me updated on your cursive progress. ???? Thank you so much for your generosity in replying. I’m aware of Dawn Nicole Designs but will definitely follow your link! This looks awesome! Definitely going on my holiday wish list! Just a quick question though- since you have the free printable templates, then why buy the full set of practice books? Why not just buy the one main book and then use the printable templates for practicing? (Unless I’m misunderstanding?) Do the other 4 books have something that the printable templates don’t have? It’s just that money is tight right now so I don’t want to buy anything I don’t have to! Hi, Nicole! The copy books have some information in the covers that the theory book doesn’t. I always recommend the full set, but Amazon does sell them separately. The theory book would be enough to get you started and you could invest in the copy books later when budgets are a less tight. Hope that helps! Genius!!! Thank you Thank you!!!! 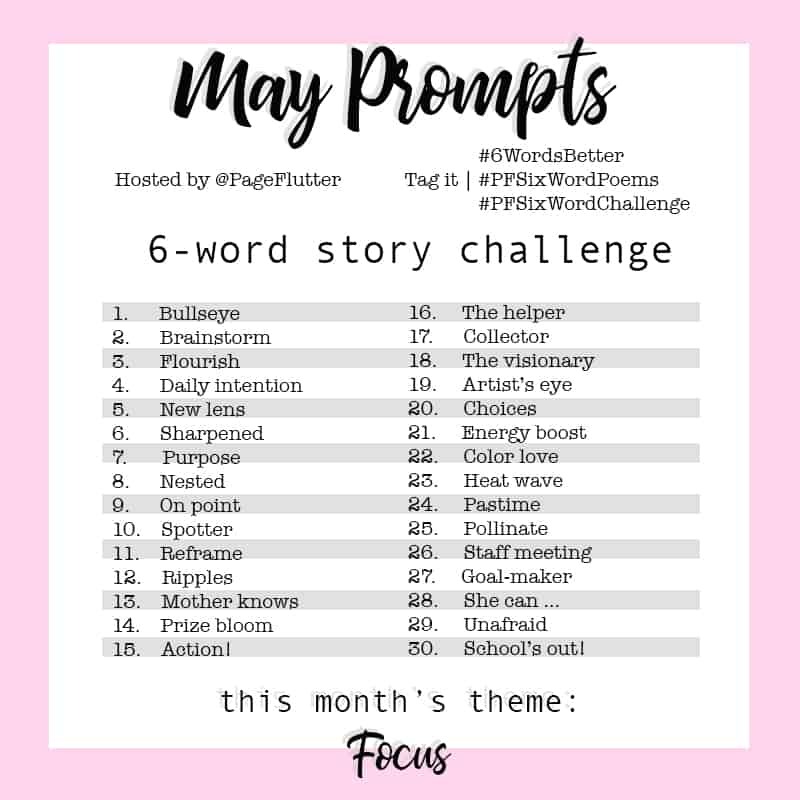 I ran out of pages for the early strokes and don’t want to buy new books. Can you suggest a non-fountain pen for this? Hi, Sheri! I really like a fine-tipped gel pen like Energels or Inkjoy. The Inkjoys are available in fine, too. I’ll link them here (affiliates).